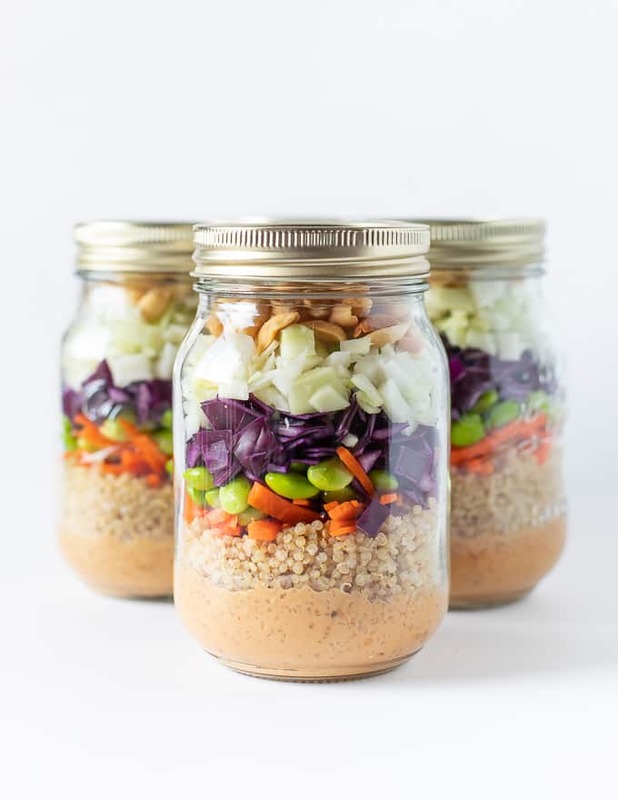 A healthy, protein packed, super tasty lunch doesn’t get any easier than this Peanut Crunch Salad in a Jar. Make up a bunch of them while meal prepping on Sunday and you will have grab-and-go lunches all ready in the fridge for your week ahead! Well it looks like I’m jumping on the salad in a jar wagon. I will be honest and say that I was a little skeptical of make ahead salads, other than my Cranberry Pecan Brussels Sprout Salad which keeps surprisingly well that is. 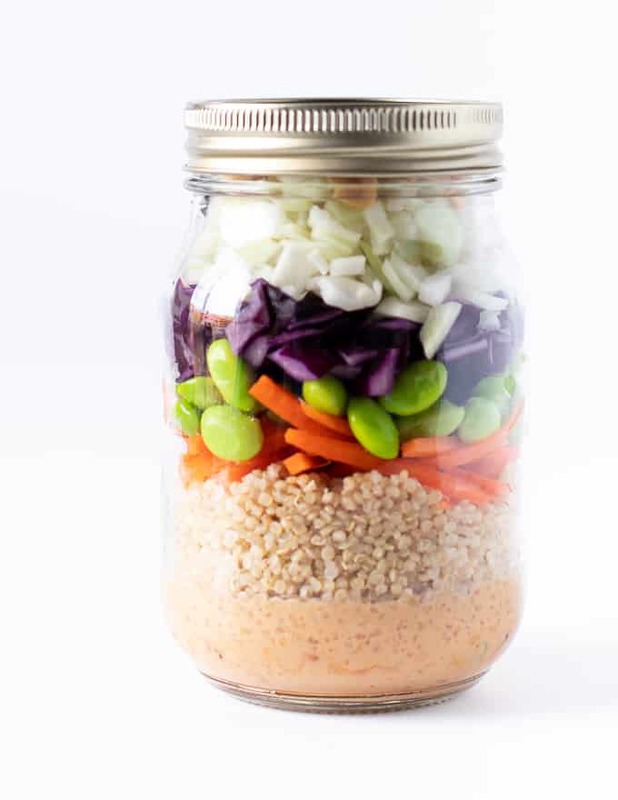 Could a jar of salad really stay fresh tasting after a few days lurking in the fridge? So if I was so skeptical, how did this recipe come about? Well, I happened to ask you guys what you would like to see from me in January, on my Instagram stories. 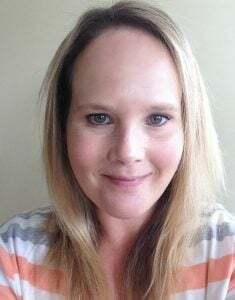 The top 3 suggestions were vegan Instant Pot recipes, vegan soup recipes and make ahead salads. Salad kind of surprised me in January, but I guess after all of the holiday indulgences, people are looking to get healthy once the new year starts. 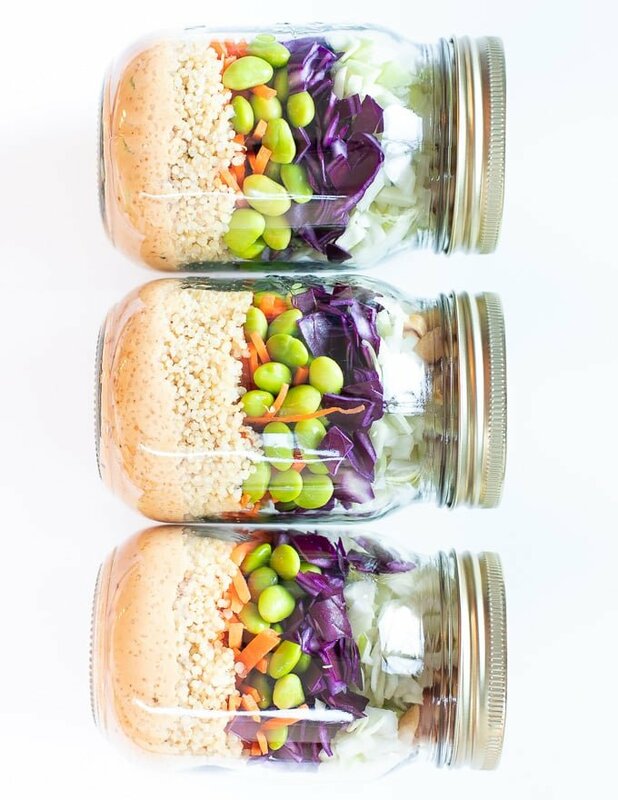 The make ahead concept immediately made me think of those pretty salads in jars that have been trendy on Pinterest for a while now, and so here we are. 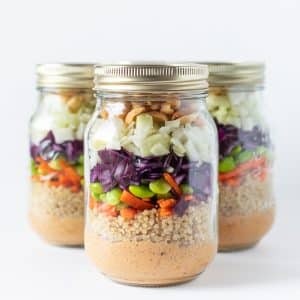 Peanut Crunch Salad in a Jar. Now no-one likes soggy, limp salad, so I chose the ingredients in these salad jars carefully. We’re talking sturdy ingredients added in the correct order to retain optimum crunch factor. WHAT DO I NEED TO MAKE SALAD IN A JAR? 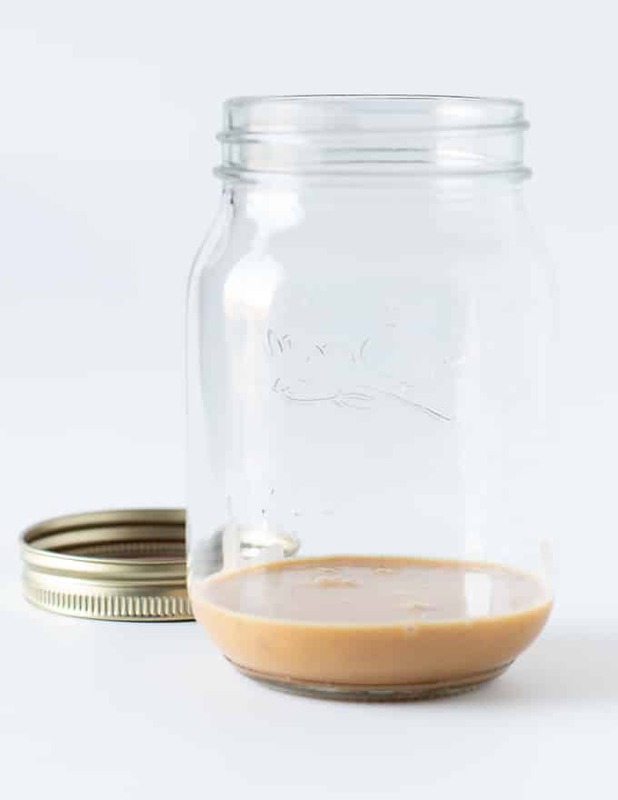 I used 500ml jars for this recipe and it will make 4 jars full. Each one is a decent size for lunch but if you are an extra hungry person, or want to eat them for dinner, you might want to use 750ml jars instead. I have a little one like in the picture above that is really handy for whisking small amounts. If you don’t have one, a fork will do the job too with a little more effort. 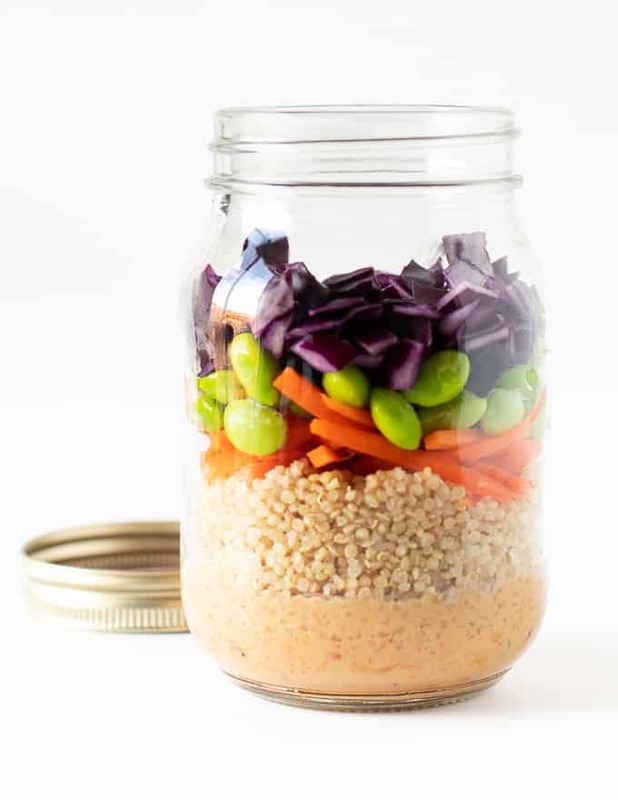 These salad jars are really easy to make. Cook some quinoa and allow it to cool. Layer everything up in the jars in the order specified. Put the lid and store until needed. They look so pretty just sitting there on a shelf in the fridge. Anyone who spots them, will instantly think you are a super healthy and organized god or goddess! 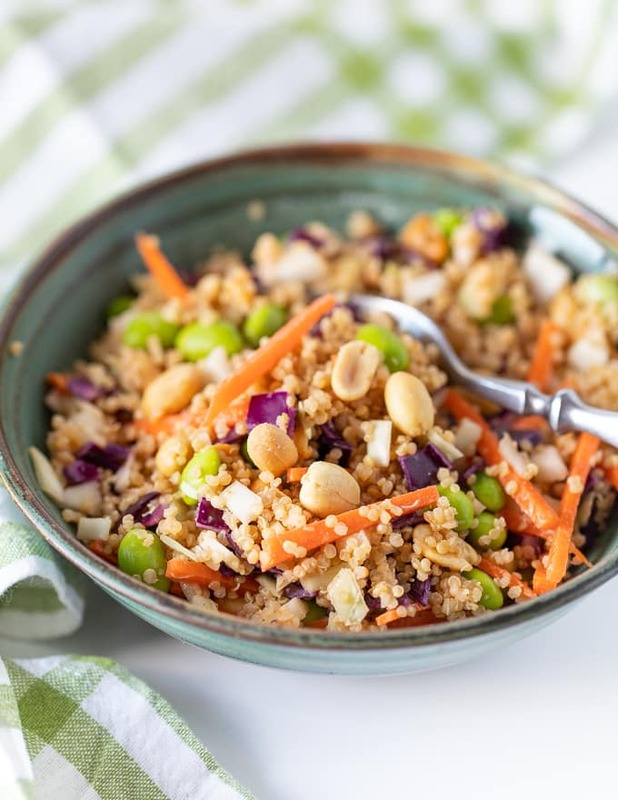 For this recipe you need 2 cups or 370 grams of cooked quinoa. To get that amount you need to cook approximately 1 cup or 180 grams of raw quinoa. I like to use my Instant Pot to cook my quinoa. It cooks grains and seeds so well and you don’t need to keep an eye on them like you do when you are cooking them on the stove top. 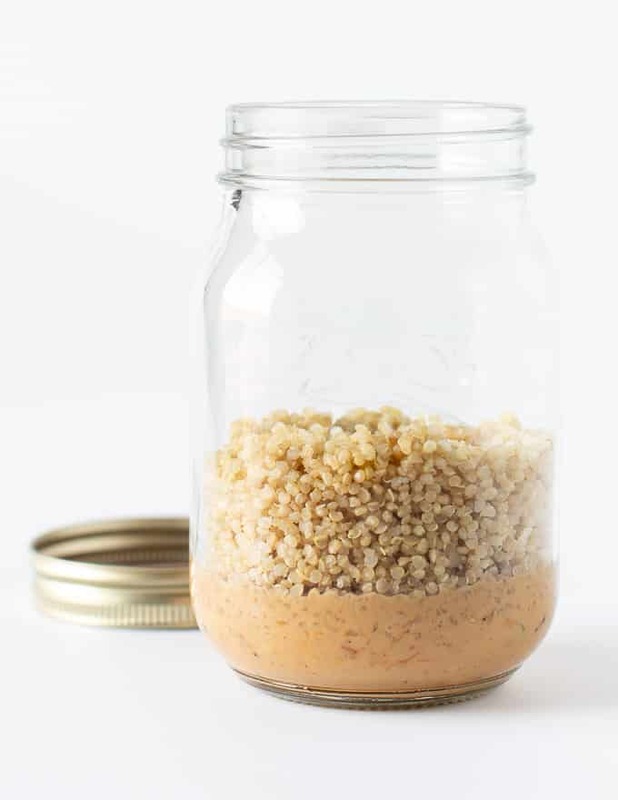 Pour in the raw quinoa and stir it around for a minute or two until it starts to smell a bit nutty. Pour in the same volume of water or broth/stock as there is quinoa, so for every 1 cup of raw quinoa you need 1 cup of water. Add salt if you want to. Stir, then put the lid on and seal the vent. Set to 2 minutes high pressure. Leave the pressure to naturally release. Remove the lid, fluff with a fork and you have perfectly cooked quinoa! If you don’t have an Instant Pot you can cook your quinoa on the stove top. Sauté the raw quinoa in in a dry pan for a few minutes, stirring constantly until it smells nutty then turn off the heat. Add 1¾ cup of water or broth/stock for every 1 cup of quinoa. Add a pinch of salt if you want to. Bring to a rolling boil, then turn the heat down to the lowest setting, cover with a lid and cook for 15 minutes. Remove the pot from the heat and let stand with the lid on and without peeking, for 10 minutes. Fluff with a fork and you have perfectly cooked quinoa! 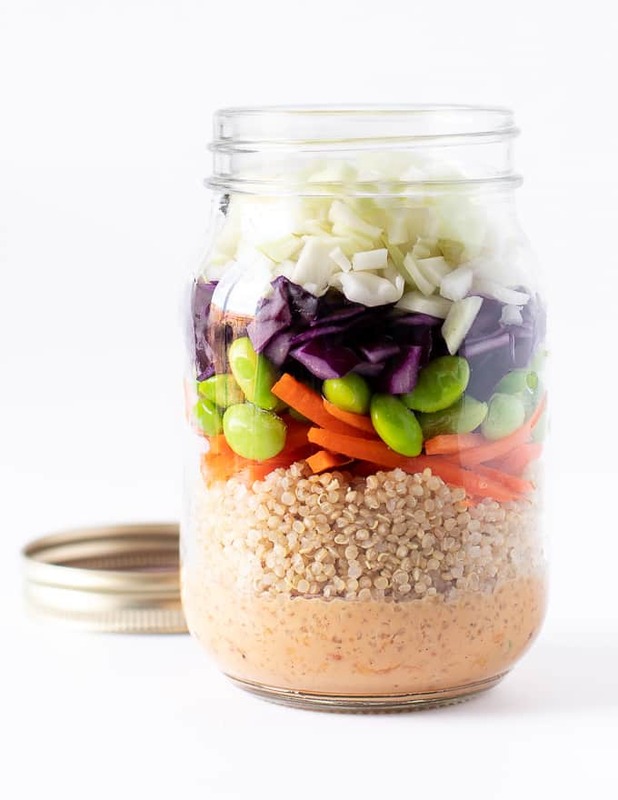 HOW LONG DOES A SALAD IN A JAR LAST? 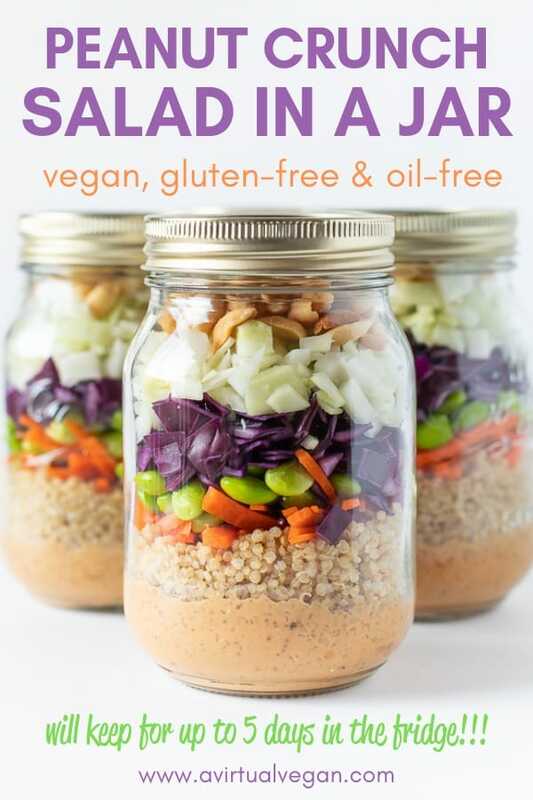 The time salad in a jar will last in the fridge really depends on what has gone into the jar and in what order, but with this Peanut Crunch Salad in a Jar, as long as you follow my instructions and use the exact same ingredients, each jar should last for up to 5 days in the fridge. It is really important to layer the ingredients up in the correct order to keep them at their best for as long as possible. The dressing has to come first and everything else is piled on top of it. The ingredients in this recipe are pretty sturdy and forgiving and they keep really, really, well. The Salad in a Jar skeptic in me was super impressed. 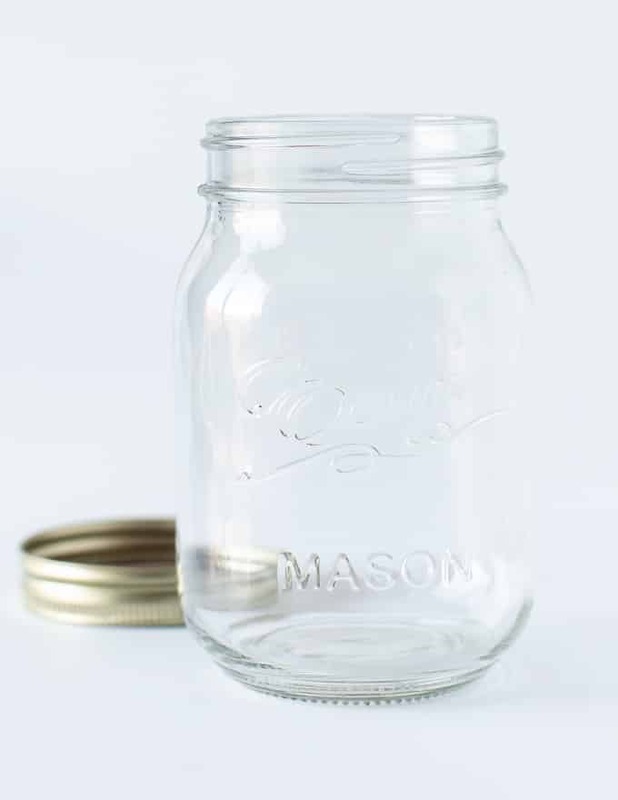 These jars taste just as good when they are a few days old, as they do on the day they are made. They really do make meal prepping a breeze! I must admit that it has been so good to know that my lunch is ready and waiting in the fridge every day. Just tip it out, toss it together, then enjoy! Packed with protein – We’re talking 19g per serving! So pretty to stare at in the fridge! 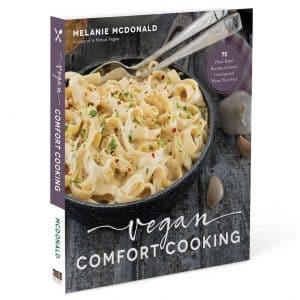 And if you ever find yourself at a loss for what to cook for dinner, griddle or pan fry a nice piece of pressed extra firm tofu, or bake a piece of vegan “chickn” and sit it a-top your made in advance salad. In fact, may I suggest making extra of the peanutty, super yum salad dressing to keep in the fridge. 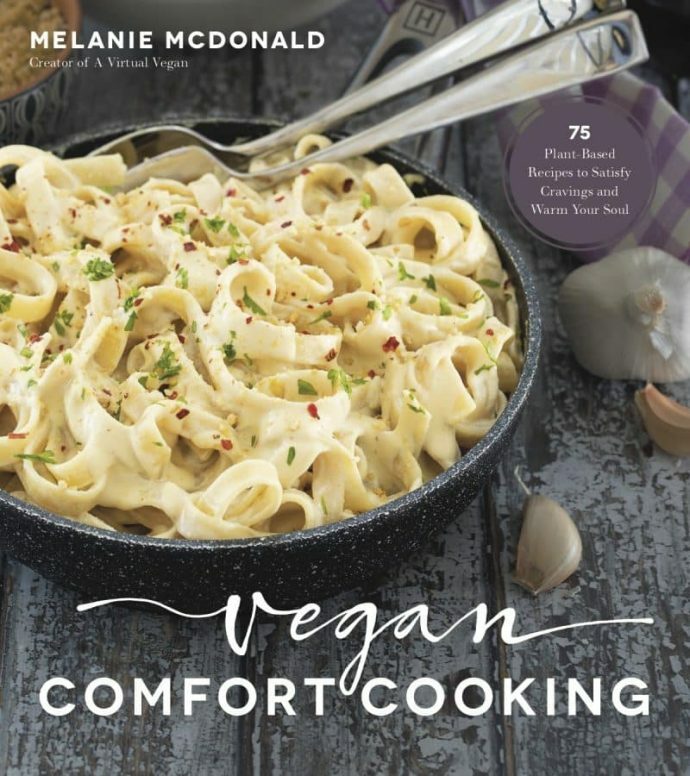 Then when it comes to pan frying your tofu, give it a head start in the pan on it’s own or with some oil, then spoon a little of the dressing over it and toss well. Allow to carry on cooking, moving frequently, until it’s all caramelized and sticky, then top your salad. Um yes please … It’s so good! Are you ready to join me on the salad in a jar train now? If you enjoy Quinoa Salads, check out my Quinoa Cranberry Salad too. A healthy, super tasty lunch doesn't get any easier than this Peanut Crunch Salad in a Jar. 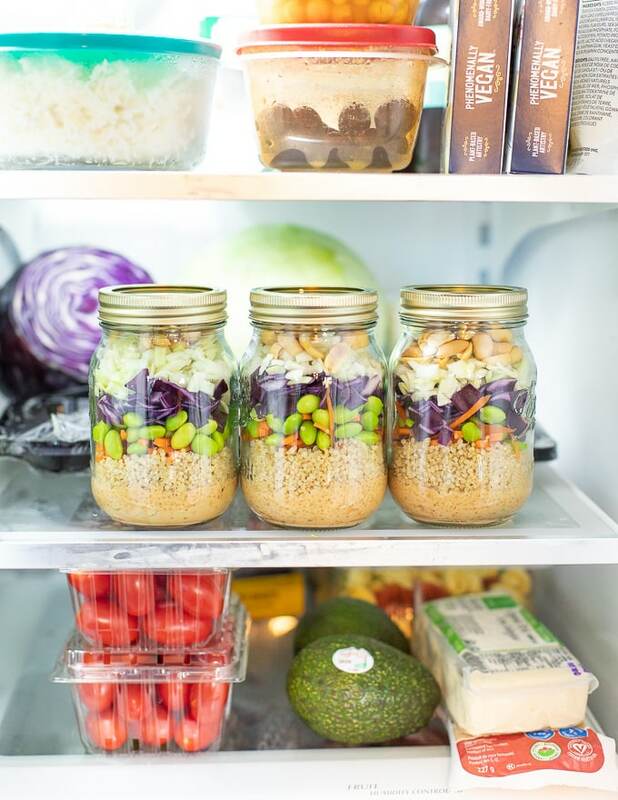 Make up a bunch of them while meal prepping on Sunday and you will have grab-and-go lunches all ready in the fridge for your week ahead! 4 green onions , cut into thin rounds, (known as spring onions in the UK). 2 cups / 370 g cooked quinoa , thats about 1 cup or 180g raw. For instructions on how to cook quinoa see above in my post. Add all of the dressing ingredients to a small bowl and whisk them together really well. Divide the dressing evenly between 4 500ml jars. Now add all of the other ingredients in the order listed and evenly between each jar. 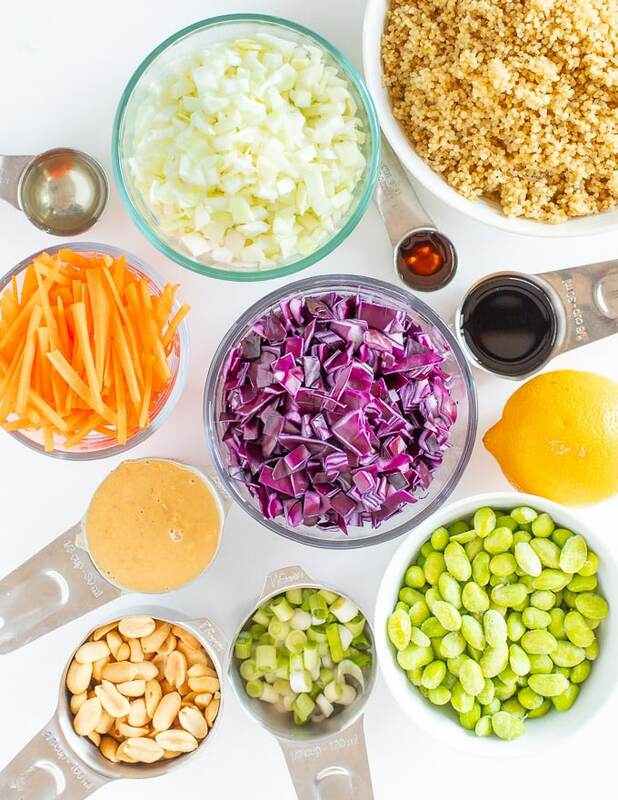 First green onions, then the quinoa, then the carrot, then the edamame beans, then the cabbage and finally the peanuts. 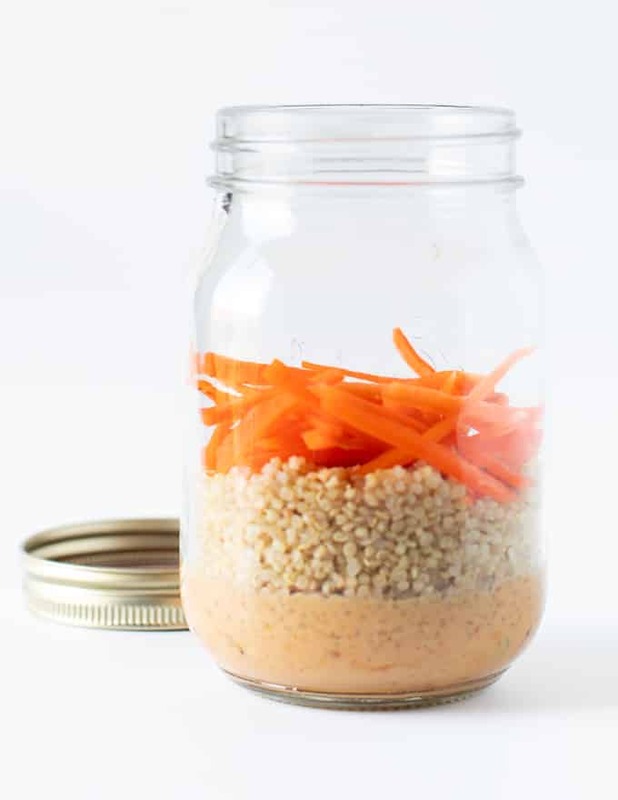 Put the lids on the jars and store in the fridge for up to 5 days. 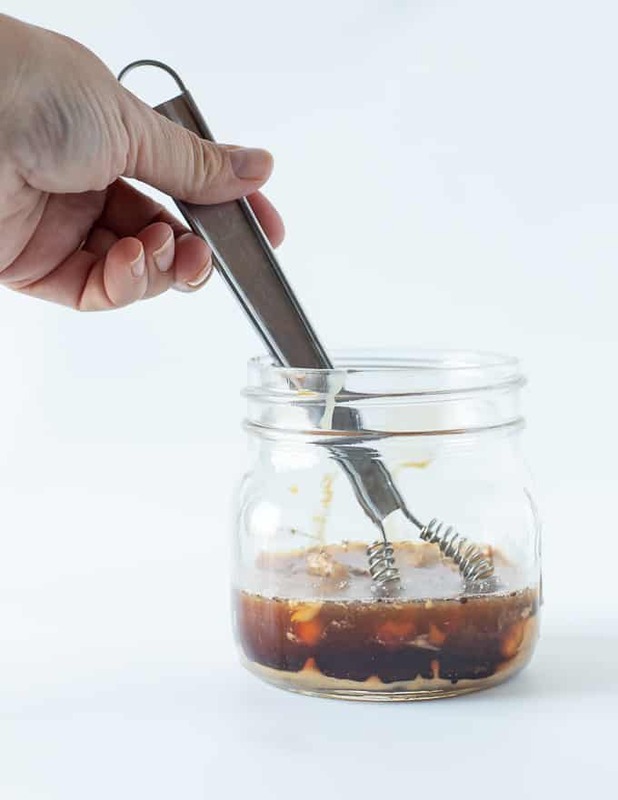 To serve, tip out into a bowl, making sure to scrape out any remnants of dressing in the bottom of the jar, and toss everything together well before eating. 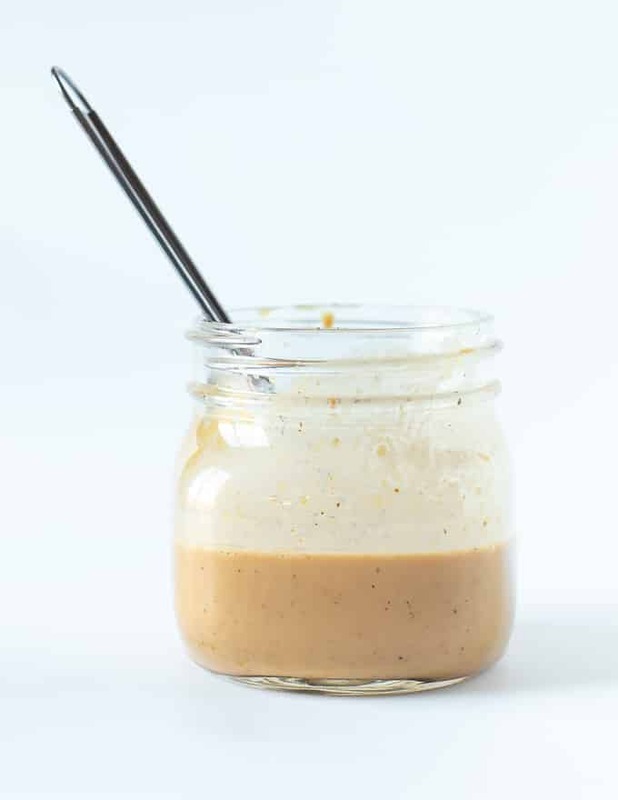 To make this recipe peanut free, switch the peanut butter for almond butter and the peanuts for almonds. 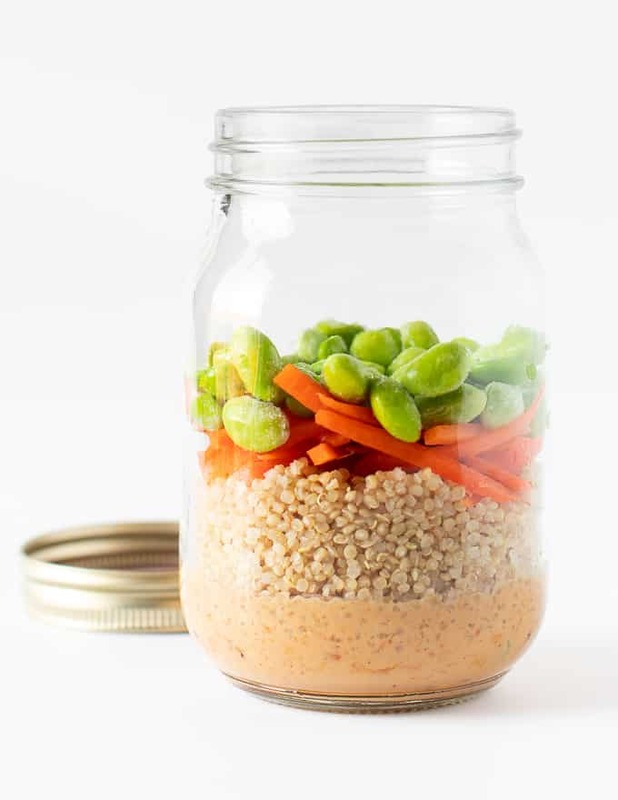 To make this recipe completely nut-free, use sunflower seed butter or tahini in place of the peanut butter and any crunchy seeds that you like instead of the peanuts.